Thermicroll® is one of the BMP Group of companies, specializing in rigid high-speed doors. Thermicroll® provides several solutions for various industries, like the Thermicroll® Air Flow (pictured below). The newest model in the Thermicroll® arsenal is a versatile door that can be used in both the industrial and civil sectors. The Air Flow model guarantees the best performance in terms of speed (up to 2 m/s during opening), security, and durability, combined with aesthetic appeal. As with all the doors in the Thermicroll® rapid door range, the Air Flow patented circular-spiral winding is made of high-density polyethylene, while the mantle is composed of galvanized steel panels. This combination of materials ensures the doors are secure and corrosion-resistant, and can be used for both internal and external openings. Permeability is the main feature of these high-speed doors: it is 25% of the panel’s area. 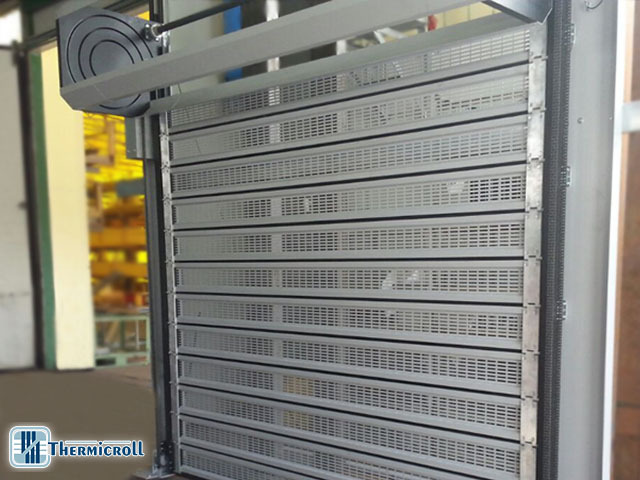 This enables great airflow through the micro-perforated panels when the door is closed, making it particularly suitable for car parking facilities or shop fronts. The features that provide versatility to the product are the very small winding, no footprint when the door is open, and no need for anchoring to the ceiling—unlike for traditional sectional doors. The simple construction minimises costs, maintenance, and installation time, but also enhances the quality, which complies with European standards. Thermicroll® rapid doors are certified as exclusive and original products, unique for their strength, practicality, functionality, and quality.